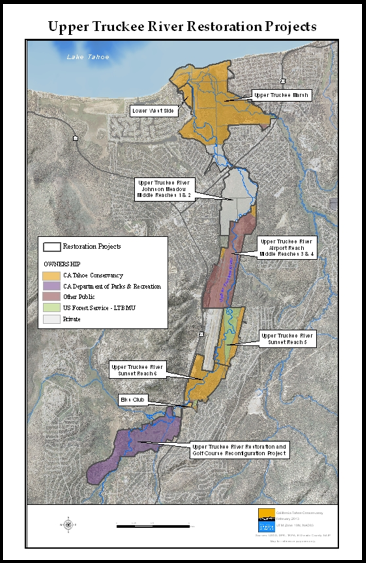 For information about the Upper Truckee Marsh Restoration Project, click here. Although 63 streams enter Lake Tahoe, nearly 40% of the water is contributed by the Upper Truckee River (UTR) alone. The River drains one of the Basin’s largest and most impacted watersheds, discharging more than 2400 tons of sediment and nutrients into the Lake every year. Fine sediment remains suspended and drastically decreases the Lake’s renowned clarity. Conservancy staff hosted a workshop focused on the Upper Truckee River Restoration Strategy to evaluate the current restoration strategy for the UTR and determine ways it can be improved and adapted. The workshop was coordinated in conjunction with US Forest Service, Lake Tahoe Basin Management Unit, California State Parks, the City of South Lake Tahoe, and the Tahoe Science Consortium.